If you have suggestions for additional information that you think would be useful in the context of ACLA's mission, please let us know! ACLA's programs are funded by annual contributions from the participating lakefront associations, with some assistance from individuals, the Township, and other sources. Representation in ACLA is voluntary. Each participating lakefront association provides a "Communications Coordinator" and a designated backup, and the Steering Committee provides overall coordination. Most of ACW's lakefront seasonal properties are subject to Ontario's regulations for development within the 100-year erosion line of the Lake Huron shore and bluff. For details, see MVCA Shoreline Policies, 100-year erosion line maps, and Proposed Shoreline Gully Policies. The Lake Huron Centre for Coastal Conservation has many guides that are of particular interest to lakefront property owners, such as: Dune Planting Guide; Climate Change; Coastal Erosion: People living on the edge. The Centre also offers a number of community programs. Pollution that affects the lakeshore community is an on-going concern. DNA analysis of tests done by ACLA in 2003 showed that the E.coli source is animal, not human. The results of ACLA's annual stream-testing program since then show that the dominant cause is untreated run-off from agricultural activities. This was clarified in a UoGuelph/MOE DNA-analysis research report published in 2009, conducted in 2005/2006 around 18 Mile River, which confirmed that the sources of E.Coli were 59-62% livestock/manure run-off, 16-18% persistent swash-zone E.Coli, 5-14% wildlife, 2-3% human, and 8-16% unquantifiable mixed sources. Through its lakeshore environmental strategy, ACLA continues to work toward end agricultural-runoff problems. These efforts have led to the creation of the Lake Huron Southeast Shore Working Group, which has launched a Healthy Lake Huron campaign to promote safe and clean beaches from Sarnia to Tobermory. Five key watersheds have been identified as priorities for immediate action. The group is working with local partners to develop and support the implementation of watershed management plans, with specific targeted actions, as well as monitoring and research needs, for each priority area. Ontario's Clean Water Act is intended to keep contaminants from seeping into the sources of our drinking-water lakes, rivers, and aquifers. The Ausable Bayfield Maitland Valley Drinking Water Source Protection Committee is responsible for developing proposed policies for our area. Huron County also has a number of related water-protection programs. ACLA has been urging this since 2002. In 2005, the Huron County Health Unit initiated a voluntary re-inspection program, and inspected 174 properties in 2005 and 178 in 2006. In 2010, HCHU proposed a mandatory inspection program, but the program failed to get support from enough of the nine municipalities. You might find this septic tank inspection and trouble-shooting guide useful in managing your septic system. Each year, June through August, HCHU measures the E.coli levels at all public and some test-case beaches. Levels change from day to day. E.coli levels are closely related to whether rainfall has recently carried pollutants from inland via the streams, and whether the water has recently been churned by wave action. For example, according to HCHU data, the tested levels at the beaches are lower for the last few years because lakeshore-area rainfall has been less frequent, whereas inland levels are higher. HCHU advises that if you are in the lake up to your waist and cannot see your feet, that is not a healthy place to be in the lake that day. The HCHU website contains the monitoring reports for recent years. For 2000-2007, we thank HCHU for providing the data from which we compiled the summaries for 2008-2012, 2007, 2006, 2005, 2004, 2003, 2002, 2001, 2000, and this trend-line graph. In conjunction with MVCA, ACLA conducts water-quality tests each year to help identify the inland sources of contamination (see location map) ... 2014 2013, 2012, 2011, 2010, 2009, 2008, 2007, 2006, 2005, 2004, 2003, 2002, 2001. 2004-03: Toronto Star What is fouling the beaches of Huron? 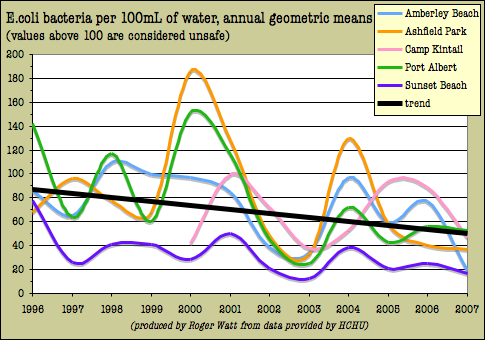 Maitland River Watershed, a 2003 report from the University of Guelph's Water Management Group ... The main pollution sources are agricultural operations and manure management practices, non-conforming septic systems, municipal wastewater, and urban run-off. Maintained by: ACLA Steering Committee.